Nepal - A little over a year since Nepal was devastated by a massive earthquake that left thousands dead and hundreds of thousands homeless, the country is poised to enter the reconstruction phase. 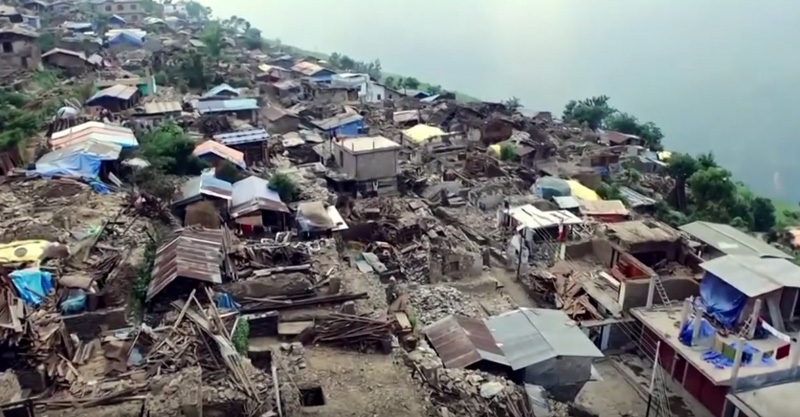 To mark the transition from relief through recovery, IOM today released a video documentary dedicated to the people of Nepal in appreciation of their determination and resilience. “Foundation of Hope: Year One of Relief, Recovery and Reconstruction in Nepal” https://youtu.be/IUGtQKzS2gg was directed by Nepali award-winning documentary film maker Ganesh Panday and an all-Nepali crew, including a cameraman who lost four members of his close family in Sindhupalchowk in April 2015. The documentary showcases the stories, in their own words, of a representative few of the more than 1.8 million Nepalis that IOM’s programmes have assisted over the past 12 months and the feats of extraordinary courage, grace, and resilience of the Nepali people as a whole. Also featured in the documentary is IOM Nepal Chief of Mission Maurizio Busatti, who reveals how over 30 years ago, at the start of his humanitarian career, he experienced a huge earthquake in his own country - Italy. He praised the courage and humanity of his staff and the Nepalis he has met and worked with over the past 12 months. “Over the past year we have seen how extraordinarily brave and resilient the Nepali people are. They came together to help each other, shared what they had and volunteered in temporary camps. Families and friends around the world also immediately sent assistance, tripling remittances in the aftermath of the two earthquakes,” he observes. To date, 1.8 million Nepalis have been assisted by IOM’s relief, recovery and reconstruction programme through the provision of emergency shelter assistance, shelter support and capacity building to empower Nepalis to build back safer. IOM has contributed to camp coordination and camp management, debris removal, income support, protection, and health and psychosocial services for earthquake-affected communities. Looking forward to the reconstruction phase, there are formidable challenges. Topography alone is daunting, as are the number of affected people and the diversity of the needs to meet: there are still over 27,000 Nepalis living in temporary settlement sites in the worst-affected districts. 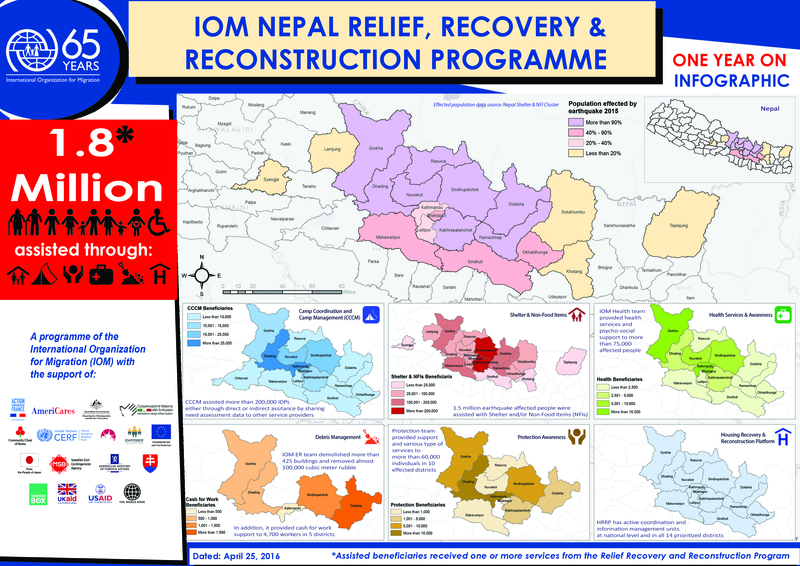 IOM, its UN partners, civil society and volunteer organizations will continue to support the Nepali National Reconstruction Authority’s efforts to ensure that the most vulnerable, including female-headed households, people with disabilities, the elderly, children, the underprivileged and other vulnerable groups receive the assistance they need. For further information, please contact Jitendra Bohara at IOM Nepal, Email jbohara@iom.int, Tel: +977.801004571.